After a few months of complaints from the community, Heroes of the Storm is finally getting a much-needed overhaul to its ranked mode. The biggest addition is bans, two for each team split between the start of the draft and the middle, that will hopefully create more interesting games. It comes along with a series of other changes aimed at everyone getting more enjoyable games, more regularly. Changes not enough for you? Here’s the best Dota 2 heroes if you’re thinking of doing a switch. 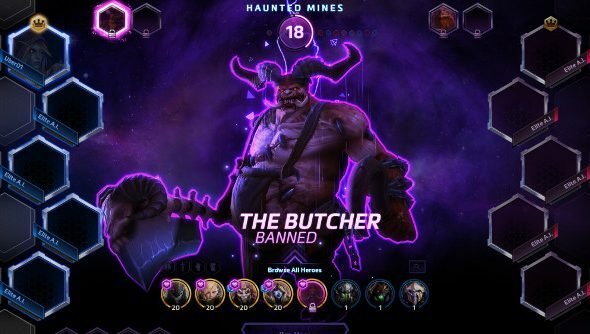 Mid bans introduced to all rank games, the same system used in official HotS tournaments. The addition of bans means each player must now have access to 14 or more heroes at all times, either through the F2P weeks or having bought them. They must also now all be level five or greater, to stop players trying a hero for the first time in these more competitive environments. Blizzard have also improved the look of the draft lobby overall, including making it easier to find the heroes you play most often, or ones you prefer. Along with this, the new PTR patch brings the usual list of balancing and bug fixes, plus new battleground Lost Cavernand StarCraft hero Dahaka, from the Heart of the Swarm campaign. Have a look at the full list here. Should go live some time in the next week, if previous timescales are any indication.